German union ver.di are part of the Union Island project, and have launched their first work on the island, a great exhibition on the campaign a national minimum wage for Germany. Based around an articulated truck trailer that they use for their Real Life campaign, they show portraits and case studies of 10 people for whom the lack of a consistent minimum is a big problem. Outside the trailer, you can see photos and video from their campaign last year, taking the truck on tour all around Germany. 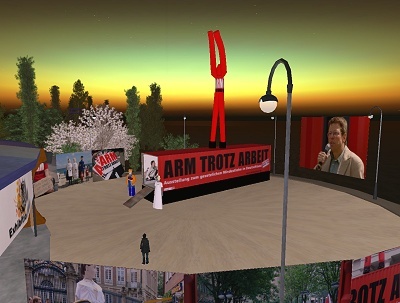 You can see the MindestLohn exhibition on the exhibition plaza at Union Island. It will be running on the island for all of March 2008. Pick up a Working Poor t-shirt so your avatar can show their support too.